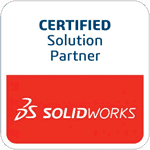 Springville, CA, March 21, 2013 – TEDCF Publishing, a SolidWorks Solution Partner and producer of interactive, multimedia training courses, today announces the availability of SolidWorks 2013: Sheet Metal Design. The course has over 3 1/2 hours of instruction that teaches users how to create sheet metal parts and assemblies. Users also learn how to build templates that will streamline the process of creating parts and assemblies. David Melvin, PE, the author of the course, demonstrates how to use K-Factors, how to set up sheet metal drawings, how to work with multi-body sheet metal parts and much more. “This course is exceptional,” said Will Lassiter, a sheet metal fabricator and TEDCF customer. “The K-Factor calculator has definitely helped with my part creation and in turn sped up my workflow”. The course also comes with a K-Factor calculator that calculates Bend Allowance, Bend Deduction, K-Factor, Setbacks, and Nominal Bent Length. This course is the final part in a four part series of courses for SolidWorks 2013 that will be released this year. It is currently available in three formats: DVD, direct download, and through the TEDCF Streaming Video Service. Visit Sheet Metal Design 2013 to learn more and watch sample lessons.